Earlier this summer, Belmont sent four family nurse practitioner (FNP) students to Cambodia for a service-focused Maymester experience. While they were there, the students treated nearly 550 patients in both rural and urban areas and visited cultural sites throughout the country. The group, which included Kelsey Bivacca, Allison Courtney, Kendall Schoenekase and Hannah Stirnaman, was funded through scholarships provided by Hope through Healing Hands and CVS and partnered with Freedom’s Promise, a Nashville-based nonprofit and Sihanouk Hospital for Hope in Phnom Penh. Prior to leaving Nashville, the group prepared for their trip by spending time together, researching Cambodia, becoming more familiar with Cambodian culture and discussing basic travel expectations. 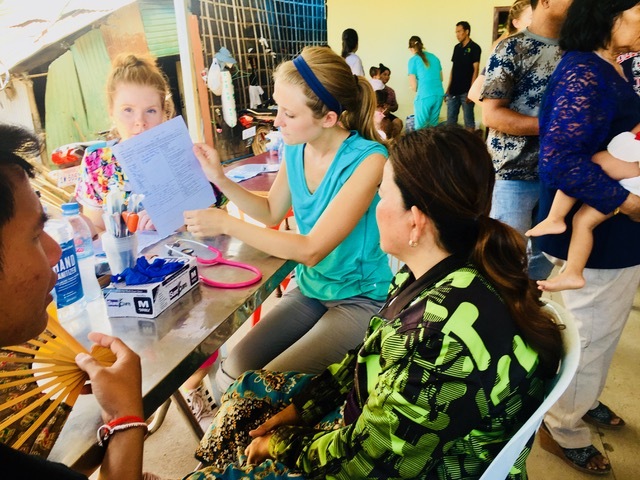 Upon their arrival to Phnom Penh, their home base for the trip, the group began traveling throughout the country, popping up interprofessional clinics made up of both nursing and pharmacy students. The FNP students were responsible for gathering patient history, assessing, diagnosing and treating each patients, with the help of a translator. Bivacca examines a patient in the back of their van.